Posted in Rants on October 8, 2007 at 11:01 pm. The kilogram is a unit of mass. The pound is a unit of weight. Weight is the gravitational force exerted on an object. Mass is not affected by gravitational fields (barring relativistic effects, at least). A kilogram weighs 2.2 pounds on Earth, and weighs one-sixth that on the moon. That does not mean that an object’s mass also decreases by a factor of six when you put it on the moon. If you really want to talk about the weight of the stuff sent up on the Apollo missions, start using newtons as your metric measurement instead of kilograms. And people wonder why the probes we send to Mars go off course. Posted in Links, Rants on July 18, 2007 at 12:24 am. Most people have tried Googling for themselves. For example, if you Google for my name, the first hit brings you to this blog, as you might expect. If you instead Google for Benji Milanowski’s name, the first hit brings you to, um, this blog again. But have you ever tried searching for your name… on Google Maps? If you try searching for my name on Google Maps, you get exactly one result. My last name begins with a K, whereas his first name begins with a K.
I wrote a program that tries to use genetic algorithms to play Nintendo games (what ever happened to that anyway? ), whereas he operated a young-earth creationist theme park called Dinosaur Adventure Land. I got a federal tax refund this year, whereas he got sentenced to ten years of prison for federal tax evasion. So yeah, that search result couldn’t possibly be more wrong. It doesn’t even have Kent Hovind’s current address (Federal Correctional Institution, Edgefield, South Carolina). So you want to complain about an ending? Posted in Rants on June 13, 2007 at 11:16 pm. While I do appreciate your concerted efforts to knock Paris Hilton off the top spot on the Entertainment section on Google News, enough with the whining already. Seriously. If you really want to complain about an ending, go watch The Prisoner. There’s a lot more in its final episode to go on about than just the very last scene, let me tell you. Of course, even if you complain about The Prisoner’s ending instead, you’ll still be wrong. It’s not my fault you miss the point. Posted in Fanboyism, Rants on June 10, 2007 at 11:43 pm. Me: OK, so I know it’s a lot later than what I promised, and I know it’s awfully dorky, but I do have some images, so can you post it anyway? Editor (also me): That depends. Do the images reinforce the dorkiness? Me: … Yes? But some of them have captions. Editor: *sigh* That’s debatable, but fine. I’ll post it. Me: This counts as your disclaimer, folks. 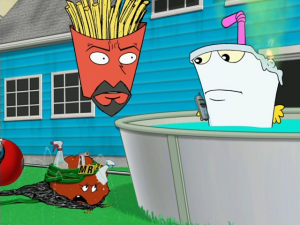 Remember that episode of Aqua Teen Hunger Force where Master Shake tries to become a superhero? He steals some radioactive waste from the “storage facility” (a.k.a. the river), dunks some worms in it, tries to get the worms to bite him, fails, and dumps the waste on himself, thus supposedly giving him superpowers. Over rain. For some reason. Of course, in the end it works about as well as it did in that one Family Guy episode, but that’s not the point. Between dousing himself in radioactive waste and his eventual (literal) meltdown, Shake focuses on marketing his new superhero identity rather than doing any actual superheroing. Most of these efforts are naturally inept, such as his The Drizzle cell phone giveaway or his black-ink-on-black-paper stationery. So, even Master Shake, someone who at best enjoys a fleeting and tenuous grip on reality, understands that making a graphic too complex can ruin it. So why can’t a certain set of professional animators understand that? I am talking, of course, about the logo redesigns in the forthcoming new Neon Genesis Evangelion movies. 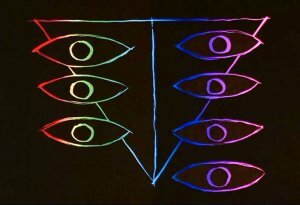 Let’s take the original logo used by SEELE. Now this is a logo befitting a shadowy, secretive organization that’s pulling the strings and orchestrating events for its own mysterious goals. The logo tells you nothing about who they are or what they’re doing, but it’s clear they’re powerful and probably evil. They’ve got the Illuminati outclassed: their logo’s got seven eyes, and their pyramid’s upside-down. What does that mean? They certainly aren’t going to tell you! And as for the rainbow coloration, um, that’s a good question actually. Maybe it’s there to annoy Jerry Falwell or something. 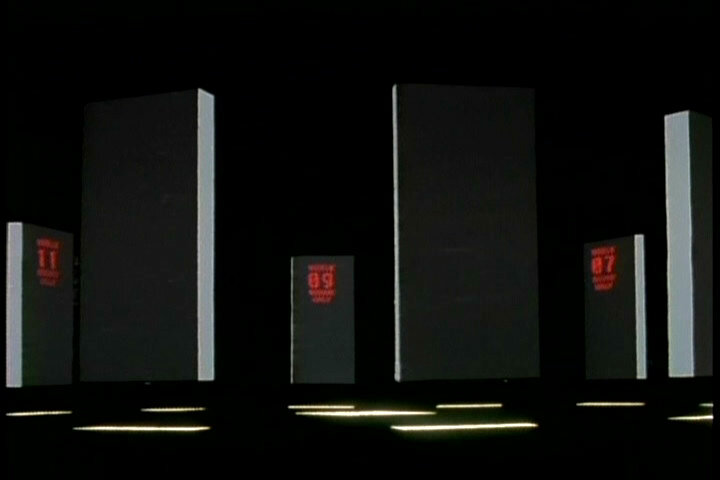 SEELE 01: Good call on the monoliths, Jenkins. Think of all the money the animators will save with slow pans over a static image! SEELE 06: Not to mention not needing to come up with character designs for all of us! SEELE 03: But Chairman, what if the audience starts to lose interest during these scenes? SEELE 11: We could use the money we saved from the animation budget to, I don’t know, interrogate a naked chick at our next meeting? SEELE 01: Brilliant! Let’s pencil Ritsuko in for our meeting in Episode 23. Now take a look at this redesigned abomination. That is, if your eyes can even decide what part of it they’re supposed to focus on first. There is way too much going on here. 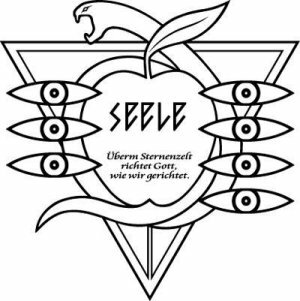 And OK, the snake coiled around an apple makes sense if you understand just what SEELE’s trying to do, but is it really necessary? It’s not like there weren’t already plenty of references to that part of Genesis in the series already, what with the whole Adam and Eve thing being warped into an important part of the plot and all. Although I suppose Evangelion has hardly been subtle about its use of Judeo-Christian imagery to begin with. Misato: Um, yeah, wow. I’ve just got one question about this. Kaji: Just one? I can think of a dozen. Misato: Good point. 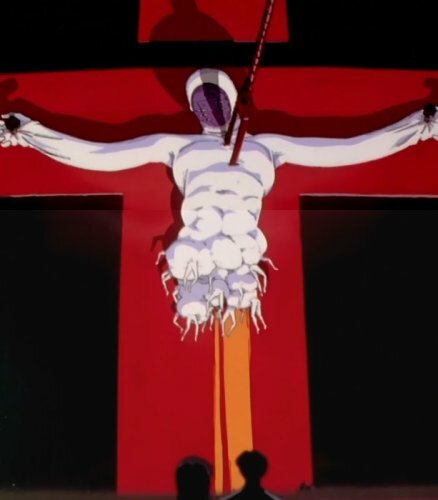 But I mean, is this whole crucifixion thing actually symbolic, like the Sephirot in Gendo‘s office, or is it just there to look cool and meaningful like all those inexplicably cross-shaped explosions? Kaji: Except for it being named Lilith, I’m guessing the latter. Misato: Well, at least the imagery can’t get any more over-the-top than this. Kaji: Are you kidding? Have you seen the movie? But the unnecessary redesigns don’t end there, oh no. 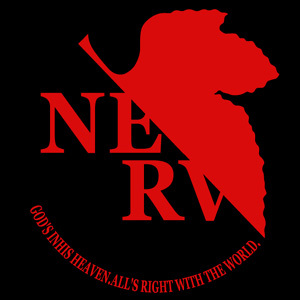 They even tamper with the classic, if not iconic, NERV logo. Being a publicly known paramilitary organization ostensibly working for the UN, NERV’s logo isn’t quite as sinister looking as SEELE’s. Nevertheless, the logo still makes it clear that they’re hiding something, even though in the public eye they’re The Good Guys. Note especially how their name is partially obscured by the half fig leaf. A fig leaf’s at least a little more subtle than a snake-and-apple. But don’t try telling me my criticism of the added SEELE slogan should also apply to the Browning quote that arcs along the bottom here, because it doesn’t. 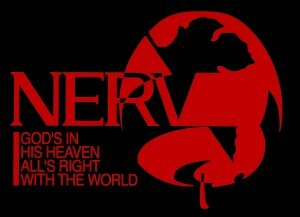 First, NERV’s slogan is at least scrutable. Besides, NERV is publicly recognized, remember? Of course they’re going to have a slogan that sounds reassuring, even though later on you learn just how ironic it is. Besides, the old logo is far better than this new abomination they’re trying to foist on us. To quote Master Shake in a cameo on Sealab 2021, did an elephant paint this? Who thought superimposing an upside-down apple (again with the apple!) over the half fig leaf with some swoopy highlights was a good idea? It looks like someone went crazy go nuts with the filled polygon tool in MS Paint. It’s almost indecipherable. I mean, what’s going on with the part to the immediate right of the V? And as for the design of the slogan, it gets a resounding meh. It’s just sort of… there. But lest you think Evangelion’s only about using religious iconography in weird ways, don’t worry. There’s also plenty of superficial allusions to genetics and molecular biology — the series could probably justify putting an “In Popular Culture” section under the Wikipedia article for Pribnow box, which would be quite an accomplishment. And of course, there’s a healthy dose of Freud to be found too. 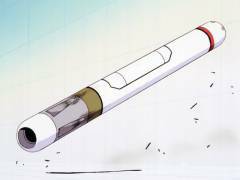 A cigar may just be a cigar, but a long cylindrical tube you sit in to be inserted into the body of something that contains the soul of your dead mother? I’m pretty sure we all know what that represents, Oedipus Shinji. At least it only goes into the back of the neck, though I can imagine what might come out of Rule 34. Stupid Internet. So, given how the two logo changes seem to beat the viewer over the head with the existing symbolism , I can only assume the remake movies are going to be cranking things up to eleven. So, in other words, I predict it’ll be The End of Evangelion all over again, but for the entire series instead of the last two episodes. Which is simultaneously exciting and frightening. In conclusion, that is how you judge a series of four movies based solely on two small images taken from them. Next time: judging books by their covers. Posted in Rants on April 26, 2007 at 9:07 pm. Why does my new printer come with an AOL CD but not a cable to hook the printer up to my computer? I mean seriously, who actually subscribes to AOL anymore? Posted in Rants on March 11, 2007 at 12:03 am. Unless you’ve been living under a rock lately, you’re probably aware that that Daylight Saving Time (note the lack of a terminal “s” anywhere) has been bumped up to this weekend instead of the first Sunday in April, and that people are predicting all sorts of doom and gloom as computers that are smart enough to self-adjust for DST but not smart enough to be aware of the rule change will not only not adjust themselves not, but will adjust themselves on the wrong day from now until heat death or the repeal of the Energy Policy Act of 2005, whichever comes first. For some reason, people have ridiculously strong feelings about DST. Or at least, people in Indiana do, where believe it or not it’s a significant political issue, with the state having recently joined all the ones around it in observing it. Of course, this is a state where people voluntarily call themselves hoosiers, so, you know, there’s that. As for myself, I could go either way on the issue. What’s important is that there’s some consistency. If everyone uses DST, fine. If nobody does, that’s also OK. When some people do and some people don’t, that’s where you have a problem, as there’s a period of at least several weeks where you have no idea what time it is where those other people are — are they still an hour behind, or are they the same as us now? What about next week? If you ever try traveling from one part of the state that doesn’t observe DST to one that does, at a point near the boundary of DST observance, over the course of a weekend where DST goes into effect, well, you will have no idea whatsoever what time it is. I can speak from experience on this. And don’t think your cell phone’s clock will bail you out, either; its clock will depend on which tower happens to be closest at any given moment. At times like these (or possibly at times like an hour ago, depending on whether you remembered to change your clock yet or not), you might wonder why we bother with DST to begin with. Ostensibly, the main reason is energy conservation. Aligning human activity cycles with daylight in principle results in lower energy use, as you don’t have to turn as many lights on to see. Since people are far too stubborn and set in their ways to voluntarily adjust their schedules as the times the sun rises and sets change along with the seasons (stupid axial tilt), the government tricks us into doing so by shifting our entire temporal reference frame by an hour twice a year. And that’s what’s at the heart of the matter. Our reckoning of time is pretty much arbitrary anyway. Sure, the notion of a “day” is largely determined by our planet’s orbital and rotational parameters, and seems pretty cut-and-dried (until you start worrying about solar days versus sidereal days, at least). But once you start subdividing that, things get pretty arbitrary. Why divide the day into 24 hours? Tradition, and the fact that 24 is divisible by almost anything you can throw at it, which makes the math work more easily. How do we decide when one hour ends and the next begins? Traditionally, we’ve used solar noon, the time the sun is at its highest, as the reference point. Of course, the time of solar noon varies with longitude, which becomes confusing once you start interacting with people outside your own town, where the difference in your local noons starts being measurable. One of the factors leading to defining standard time zones, after all, was the confusion in trying to figure out what those times in train schedules actually meant. But with time zones, 12:00 pm only corresponds roughly with local noon, and not even very well if you’re a country like China that insists it’s a single time zone despite being wide enough for five. But if some of us are willing to go that far for consistency, then why shouldn’t we be willing to drop the fiction that 12:00 pm means anything anyway, aside from some arbitrary reference point to start ticking off the hours from? Why don’t we drop time zones altogether and all use the same time reference? In other words, why not have one worldwide time zone? It certainly makes managing clocks a lot easier — they’re all set to the same time. Most computers do this internally anyway; “local time” is just an adjustment the computer applies before displaying it to you, which is why it’s able to adjust for DST automatically without getting hopelessly confused even if it runs continuously through a certain weekend in fall. And with the time our clocks display divorced from any local astronomical phenomena, DST is pointless. Plus, you get the benefit of always knowing what time it is, anywhere on the planet — just look at the closest clock. Sure, it might sound weird for your day shift to be from, say, 1:00 pm to 9:30 pm, but that’s just because we used to call it 8:00 am to 4:30 pm. The only reason you associate 8:00 am with morning currently is because that’s when 8:00 am happens to be. If you were raised under a unified time reference, the first system would seem just as nutty. And there’s no more confusion with the solar time-of-day under a unified clock than we have with time zones now. Someone being two hours behind is just as valid — their morning is still two hours after yours. It’s just a matter of their morning being at 3:00 pm instead of 1:00 pm like yours is. There’s no fundamental difference in they way you think of the solar time difference, but now you have the advantage of a stated time being interpreted unambiguously worldwide. So, this weekend, take a stand for restoring sanity and reason to our temporal reference. Don’t set your clocks ahead an hour. Set them to Coordinated Universal Time and take comfort in the fact that you’ll never have to set your clock forward or back ever again, regardless of where you go or what time of year it is. And while we’re at it, can we please drop this whole am/pm nonsense and go with 24-hour time too? Posted in Rants on February 20, 2007 at 10:34 pm. What would happen if you were to fill a one-quart plastic bag with 3-oz tubes of toothpaste plus one 4-oz tube of toothpaste, and try to take it through a TSA checkpoint? By my reading of their guidelines, the screener would confiscate the 4-oz tube “for security reasons” but let you through with a one-quart bag almost full of 3-oz tubes. The screener would probably also look at you weird, but that’s not in the guidelines. Posted in Rants on January 28, 2007 at 12:21 am. Here’s a textbook example of why you should be skeptical of science stories reported in the mass media. A scientist studies the physiological factors in sexual orientation of sheep. Then PETA learns about it and complains about how (a very small number of) rams are being killed to study their brains. A blog notices the press release and further distorts the story into scientists working on a way to eliminate homosexuality from the human population. The distortion spreads among blogs, gets picked up by a newspaper too lazy to check the facts, and then that spreads to other newspapers. Of course, some magician‘s radio show gets to the bottom of it long before corrections start appearing in newspapers. Not that technology reporting is any better. It’s painfully obvious to anyone with even a bit of knowledge in the area that technology stories tend to be written by people who know absolutely nothing about the topic and are largely cribbing some company’s press release. You’re best off avoiding these and instead reading sites that actually have a clue and are happy to do a little digging. Even worse is mass media reporting on anything to do with court cases. These stories are invariably framed as the court ruling in favor of one side over the other (typically “big business” versus “the little guy”), whereas the court is actually ruling on a particular issue in dispute between the two parties. Sure, “court sides with big business” makes a sexier headline than “court rules statute of limitations under XYZ act is measured from beginning, not end, of appeals process”, but the latter has the advantage of being accurate. This is intuitively obvious to anyone who spends even a little time following the Supreme Court, for example. The obvious trend is that the more you know about a topic, the more obviously wrong stories that appear in the mass media about it are. The inescapable conclusion is that you should be skeptical of anything you read in the newspaper or see on a TV news report. Posted in Life, Rants on December 11, 2006 at 9:37 pm. And since we’re on the subject of the Airing of Grievances, here’s one: online stores that time out when you hit the “order” button. Did it get the order or not? Who knows? In other news, now that I’m trying to use separate passwords for each account, I’ve come to the inescapable conclusion I can only remember O(log n) passwords at a time. Posted in Rants on November 23, 2006 at 11:22 am. 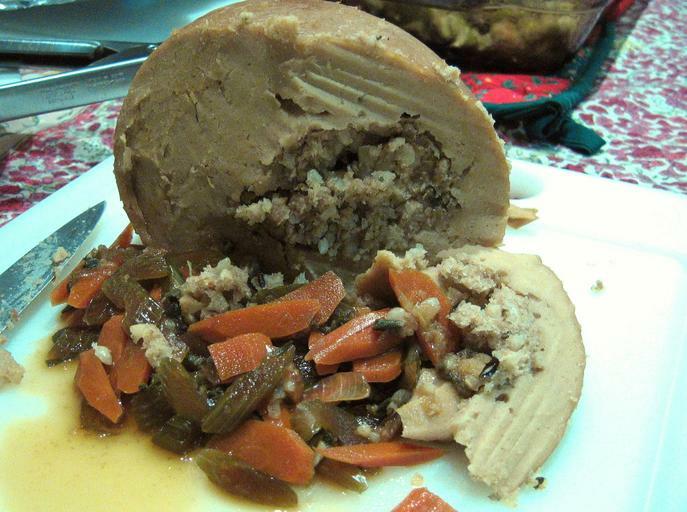 And not even food eats tofu. Posted in Coding, Rants on November 16, 2006 at 12:54 am. You know what’s fun? When you think you have a nice big chunk of code in a state that could reasonably be considered “working” (as far as pre-alpha software goes, at least), and then you turn on optimization, and then suddenly everything falls apart. One particularly cute way this can happen is if you tell the compiler a particular function’s return value is constant. gcc assumes that the function also doesn’t have any side effects, and will happily optimize away calls to it if you don’t use the returned value. This is a problem if the function not only has side effects, but you were calling the function precisely to carry those side effects out. OK, technically it’s my fault for misinforming the compiler and not realizing it until the -O2 flag called me on it. But still. Besides, I still blame the optimizer for somehow finding a way into new and exciting code paths that make test cases stop working. Apparently it’s going to take a little longer still before the next update on Wallace, since now I’ve got to go through and see what other fun little bugs the optimizer flushes out of my code. Grumble. Posted in Rants on September 21, 2006 at 9:59 pm. Consider two items: a tube of toothpaste, and a bag of spinach. Which one could potentially pose a hazard? Which one are you not allowed to take on a plane? Posted in Rants on September 19, 2006 at 9:38 pm. Suppose you are driving on the highway, and your car is in the rightmost lane of a two-lane offramp, on which the prevailing traffic is moving at near-highway speed. True or false: it is an acceptable maneuver to slam on your brakes, cut off the person driving in the left lane of the offramp, slam on your breaks even more, and then cut over to the wedge between the offramp and the main highway and come to a complete stop. If you answered “false,” congratulations, there’s a good chance you’re not a danger to yourself and others! If you answered “true,” thanks for that little bit of excitement this morning on my way to work, moron. You better thank my reaction time and brake pads that I didn’t rear-end you during your little maneuver, just as I thank the reaction time and brake pads of the person driving behind me that they didn’t rear-end me when I had to slam on my brakes to avoid you. Posted in Politics, Rants on September 12, 2006 at 9:53 pm. Maryland uses Diebold voting machines anyway, so it’s not like there’s any assurance the votes wouldn’t be tampered with anyway.